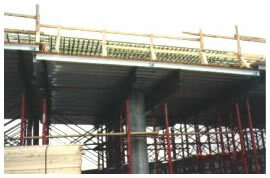 This elevated roadway structure (Length approximately 1 mile (1.61 km) was formed with SCI's 25K (11,340 kg)/Leg Falsework towers, SCI's Aluminum Joists and steel Stringers. Notice the easy transition between the thick concrete deck at the column capital area and the standard thickness concrete roadway area. SCI also provided the round FRP column forms. 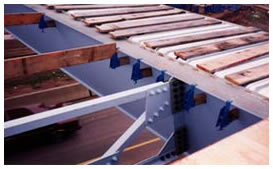 A sea of SCI Aluminum Joists used to deck this massive 450 LF (138 m) post tensioned box girder bridge. Web walls 13 ft. (4.0 m) high. 25K/Leg (4,536 kg) falsework equipment with SCI 6.5" (165 mm) Aluminum Joists. 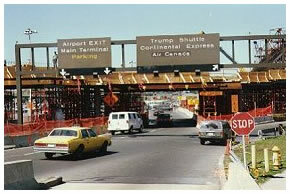 Elevated roadway structure and ramps, LaGuardia International Airport, New York, NY. 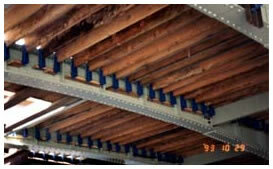 Falsework engineered by Structural Contours, Inc. Included bridge design for maintaining two lanes of active traffic below. 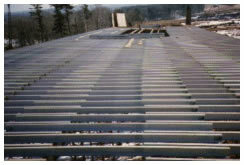 The bridge deck is 42" (1220 mm) thick over the roadways illustrated in this photograph. Interior concrete bridge decks are easily & economically formed with SCI's Adjustable Joist Hangers and Dimensional Timber joists or Engineered Joist Elements. This system allows the joists to be set at an elevation that can form the side of a haunch over the streel beams/ girders of the bridge deck.